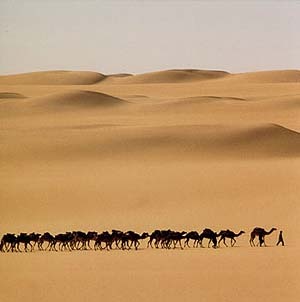 Maybe a cameltrain silhouetted against the desert? Or it could be where the desert meets the sea (lose the road altogether). Juicy. I like the chevron motif you have going, with the subtle variations in each. i might try that sometime, been busy with a christmas painting thanks for the advice. Sunsetdreams, whatever you decide to do, may I suggest using another "layer" to do it? That way you can try different ideas without affecting what you have so far. I used the chalk tool to bring out a detailed look with the metallic setting turned up some. It gave me a defined look. looks great, good luck with the rest of it. I can't wait to see your Christmas painting. Like keys on a ring, we have our own purpose, yet we are as one. thank you. i am working with the starter edition right now. part of the christmas painting has been posted. it is titled christmas. when i want to try something and i dont like it , i just undo. as always love any advice i can get from other artists. helps make you better.